[214 Pages Report] The non-destructive testing and inspection market is estimated to grow from USD 8.3 billion in 2018 to USD 12.6 billion by 2024; it is expected to grow at a CAGR of 7.24% from 2018 to 2024. Non-destructive testing (NDT) techniques are primarily used in engineering industries for evaluating different properties of structures, equipment, components, and materials without causing any damage. NDT Market and inspection is an extremely valuable technique for timely evaluation and diagnosis of faults in products. It is an important quality control tool in the manufacturing process as it allows for early detection of surface and subsurface defects in finished and work-in-progress (WIP) goods. NDT is also used for detecting faults and structural integrity in industrial assets and public infrastructures such as factory buildings, platforms, bridges, railway lines, piping systems, and industrial machinery. 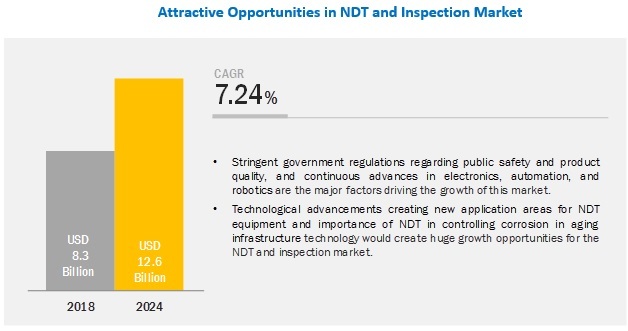 Stringent government regulations regarding public safety and product quality, and continuous advances in electronics, automation, and robotics are a few key factors driving the growth of the NDT Market and inspection market. The high adoption of IoT devices and rising need to assess the health of aging assets also propel the growth of the NDT Market and inspection market. The market for the UT (ultrasonic testing) technique is projected to largest contributor in NDT Market. It is presently the most popular NDT technique owing to its ability to accurately identify defects and determine their severity. Some advanced techniques such as ultrasonic immersion testing and guided-wave ultrasonic testing can be used for critical applications in the oil & gas and aerospace industries, among many others. RT (radiographic testing) is estimated to be the second-largest market in 2018. Recent advancements in digital radiography make RT a reliable NDT technique for inspection. NDT market inspection services are likely to account for the largest share of the market in 2018. The primary purpose of NDT techniques is to inspect objects, materials, machinery, and structures for defects so that they can be rectified in a timely and cost-effective manner. After inspection services, training services are likely to continue to gain the second-largest market share in the coming years since training NDT technicians to keep them updated with new technological trends and make them aware of changing demands of the customers is equally essential. Asia Pacific is likely to be the fastest-growing region in the NDT Market and inspection market owing to the rapid infrastructural development and adoption of automation in manufacturing industries in countries such as India and China. Countries in Asia Pacific are involved in the manufacturing of defense aircraft, which is expected to increase the demand for NDT and inspection equipment and services in the defense & aerospace industry. Many infrastructural development projects are under construction and scheduled to be constructed in the region during the forecast period. The demand for automobiles is estimated to grow substantially by 2024. Major players in the NDT Market and inspection market include General Electric (US), Olympus Corporation (Japan), MISTRAS Group (US), Nikon Metrology (Belgium), and Ashtead Technology (Scotland), YXLON International (Germany), Sonatest (UK), Zetec, Inc. (US), T.D. Williamson Inc. (US), Bosello High Technology srl (Italy), Eddyfi (Canada), and Magnaflux (US), Fischer Technology Inc. (US), Cygnus Instruments Ltd. (UK), NDT Global GmbH (Germany), Acuren (US), and LynX Inspection (Canada). GE (US) plays a vital role in the NDT Market equipment market by offering solutions for ultrasonic testing, radiographic inspection, visual inspection, and eddy-current testing, along with their related components, accessories, and software solutions. With its advanced solutions and products, the company has retained its leading position in the market. GE Measurement & Control focuses on the development of NDT products that can be widely used for monitoring, protecting, and improving the performance of industrial equipment. GE also follows the strategy of customer orientation. The company has also expanded its presence to increase its customer base across the world. For example, in November 2015, GE opened a new technology solution center in the UK to test GE’s NDT technologies and to solve specific inspection problems for its customers. Olympus is a well-established brand in the NDT Market. With its diverse business segments, namely, Medical, Scientific Solution, Imaging, and Others and a strong geographic presence, the company holds a strong position in the market. Strategic alliances, partnerships, and new product launches will help the company to gain a larger market share. Innovative product developments and launches have been leading business strategies adopted by Olympus Corporation in the past few years; for instance, in May 2018, the company launched the IPLEX G Lite ultra-portable industrial videoscope, which is used to inspect hard-to-reach areas of aircraft and piping systems. To expand its presence, Olympus has been collaborating with regional players who have technological competence. In September 2015, Olympus NDT Canada Inc. announced the purchase of 33,000 m2 of land in Quebec City’s Michelet Innovation Zone to construct a new office and manufacturing complex. In January 2018, Avitas Systems, a GE Venture, collaborated with Limelight Networks, Inc. for using its private network and distributed cloud infrastructure to deploy its next-generation, automated inspection platform. Avitas Systems Platform also utilizes GE’s Predix Edge solution, allowing users to continue to benefit from the use and functionality of GE’s Predix application services suite. In December 2017, MISTRAS Group acquired West Penn Non-Destruction Testing LLC, a provider of non-destructive testing services at its in-house facilities, for USD 74 million in cash. The acquisition enhanced MISTRAS Group capability of in-house NDT Market services, especially for the customers from the aerospace industry. In May 2018, Olympus introduced the IPLEX G Lite ultra-portable industrial videoscope, which is useful for the inspection of hard-to-reach areas of aircraft and piping. The device is highly efficient and easy to control. Which are the major techniques of NDT market and inspection? Which region would dominate the NDT market and inspection market during the forecast period? What strategies are followed by NDT market equipment manufacturers and service providers to stay ahead in the competition? What are growth perspectives of this market in different regions? What are drivers, opportunities, and challenges pertaining to the NDT market and inspection market? 7.3.2.1.1 Borescopes are Used for Inspection of Aircraft Engines, Steam Turbines, Diesel Engines, and Automotive Engines. 7.3.2.3.1 Videoscope Provides A High-Quality Image for Detecting Flaws and Streamlining the Process of Inspection. 7.7.4.1 Film Radiography is Deployed for Inspecting Hidden Flaws in Different Types of Materials. 9.2.1.1 Ultrasonic Inspection is Proven Technique to Detect the Internal Defects With High Accuracy. 9.2.4.1 Magnetic Particle Inspection is Used to Detect Surface and Subsurface Discontinuities in Ferromagnetic Materials. 10.2.1.1.1 EMAT Technique Increases the Overall Probability of Detection of Flaws and Fracture Along the Metal Surfaces. 10.3.5.2.1 Positive Metal Identification Technique is Deployed for the Identification of Flow Acceleration Corrosion (Fac). 10.4.3.1 Ultrasonic Testing, Radiography Testing, Visual Inspection, and Infrared Thermography are Major Techniques Used for Aircraft Maintenance. 10.4.5.2.1 Air Coupled Ultrasound Technique Provides Detection of Defects With High Accuracy and Probability. 10.5.1.1 NDT Market Techniques are Deployed for Components of Helicopters, Aircraft Engine Turbine Blades, Rf Materials, Straps, and Eject Handles. The study involved 4 major activities in estimating the current size of the NDT and inspection market. Exhaustive secondary research has been done to collect information about the market, the peer market, and the parent market. Validating findings, assumptions, and sizing with industry experts across the value chain through primary research has been the next step. Both top-down and bottom-up approaches have been employed to estimate the complete market size. After that, market breakdown and data triangulation methods have been used to estimate the market size of segments and subsegments. In the secondary research process, various secondary sources have been referred to for identifying and collecting information important for this study. Secondary sources include corporate filings (such as annual reports, press releases, investor presentations, and financial statements); trade, business, and professional associations such as the America Society for Nondestructive Testing (ASNT) and British Institute of Non-Destructive Testing (BINDT); white papers, location-based marketing-related journals, certified publications, and articles from recognized authors; directories; and databases. 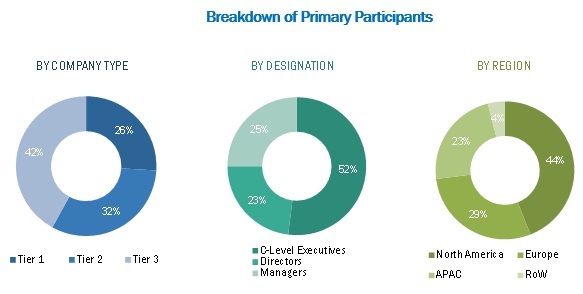 The secondary research has been used to obtain key information about the industry’s supply chain, the market’s monetary chain, the total pool of key players; market segmentation according to industry trends to the bottommost level, geographic markets, and key developments from both market- and technology-oriented perspectives. The secondary data has been collected and analyzed to arrive at the overall market size, which has been further validated through primary research. In the primary research process, various primary sources from both supply and demand sides have been interviewed to obtain qualitative and quantitative information for this report. Primary sources from the supply side include experts such as CEOs, vice presidents, marketing directors, technology and innovation directors, subject matter experts (SMEs), consultants and related key executives from major companies and organizations operating in the display market. Several primary interviews have been conducted with experts from both demand and supply sides across 4 major regions: North America, Europe, APAC, and RoW (Middle East, South America, and Africa). Approximately 25% of the primary interviews have been conducted with the demand side and 75% with the supply side. This primary data has been collected through questionnaires, e-mails, and telephonic interviews. Following is the breakdown of primary respondents. Key players in major applications and markets have been identified through extensive secondary research. After arriving at the overall market size from the market size estimation process explained above, the total market has been split into several segments and subsegments. To complete the overall market engineering process and arrive at the exact statistics for all segments and subsegments, the market breakdown and data triangulation procedures have been employed, wherever applicable. The data has been triangulated by studying various factors and trends from both demand-and supply-side. Along with this, the market has been validated using both top-down and bottom-up approaches. This report categorizes the non-destructive testing and inspection market based on techniques, methods, services, verticals, and regions.